ABOUT THIS SITE BUCPOWER.COM was established in January 2002 and has become renowned around the world as the most detailed archive for any NFL team. Every player has their own profile page, every game is reviewed with statistics, pictures and reports and every season is covered in full. There are now over 7,500 different screens on the site together with over 13,000 images dating back to the founding of the franchise in 1976. And it has been and always will be free to access. BUCPOWER.COM was created and is maintained by Paul Stewart. 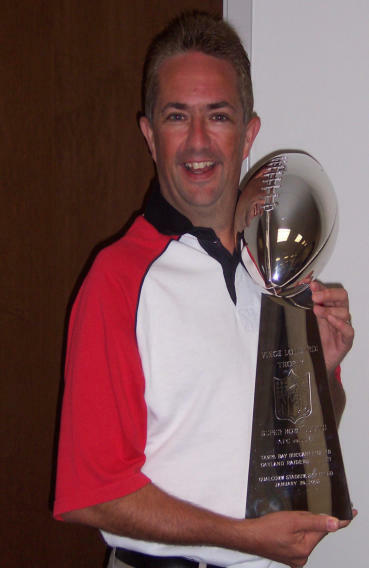 Based in England, he has been a fan of the Tampa Bay Buccaneers since 1982 and has become widely accepted as the leading historian on the franchise. He established a British Buccaneers fan club in December 1984 and ran it for nearly 30 years where it became renowned as the leading NFL fan club in the country. ABOUT PAUL STEWART He has worked extensively in the sports media on both sides of the Atlantic including presenting Sky Sports’ coverage of the NFL in 2001 and 2002. He has also worked for BBC, Channel 4 and Channel 5 as well as the printed British media. On the other side of the Atlantic, he appeared regularly on Tampa sports radio stations in addition to being a regular columnist for the former Tampa Tribune. He has also covered many other sports including golf’s European Tour for the American media. In 2009, he was the subject of an NFL Films documentary surrounding the Buccaneers’ trip to London to play in the International Series game against New England, most of which also appeared in Tampa Bay’s official 2009 season review film. He also replaced Gene Deckerhoff on Buccaneer radio during the game and called Josh Freeman’s first NFL pass. Living in Surrey, he is married to Kerrie with an 18 year-old daughter Tanith and is the only three-time club champion in the history of Sunbury Golf Club as well as being a former course record holder.